Grommets are used to treat middle ear infection (causes ear pain) which is caused by blockage of the Eustachian tube (balances the ear pressure). A surgical procedure where a tiny cut (about 2-3mm) is made in the eardrum, fluid is drained and the grommet is inserted to relieve pressure on the eardrum. 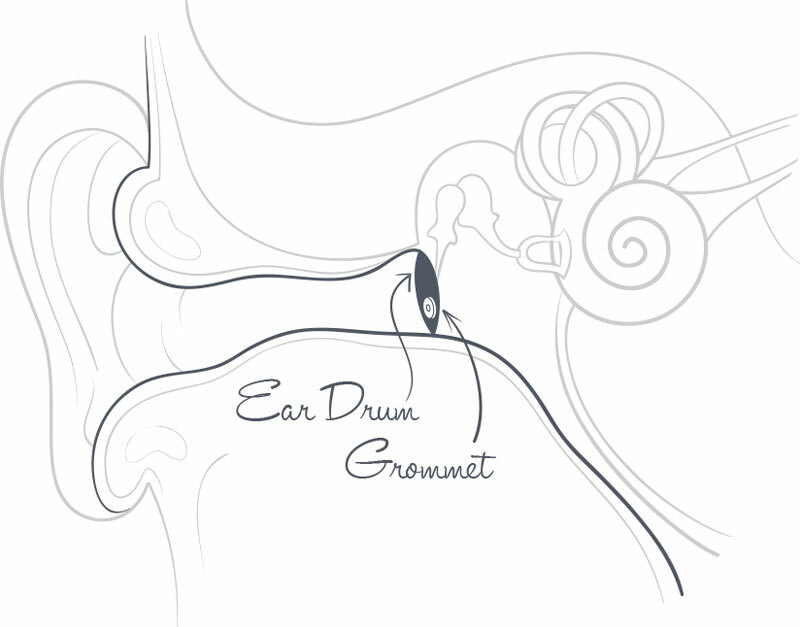 A grommet is a small tube inserted through the eardrum to allow air to pass through into the middle ear, thus releasing any pressure build up and helping clear excess fluid within. The grommet acts like an artificial Eustachian tube, equalizing air pressure with atmospheric pressure. Grommets will eventually fall out after ± 6 – 9 months post-operatively. Before the surgery, Dr Kluge will attend to you and your child. If you have any concerns, please do not hesitate to ask Dr Kluge or the nurse. You will be able to accompany your child to the anaesthetic room until he/she has fallen asleep. When he/she is asleep, a tiny cut is made in the eardrum (myringotomy). The fluid is sucked from the middle ear and a grommet is then placed in the eardrum. The risk of serious complications is very small, but please take note that a runny ear may occur any time after the operation, and no later than 4 days post-operatively. Complications may include the scarring of the eardrum and perforations but these are uncommon. Grommets may cause more frequent ear infections. Painkillers will be given in surgery – he/she may experience a little discomfort for the next 24-48 hours. Strict water precautions should be applied – use earplugs or cotton wool coated with Vaseline. Please check with Dr Kluge if he/she is allowed to swim (if so, please be sure to use earplugs and a swim cap). When cleaning the ear, avoid earbuds and rather use a damp cloth. Ears leak fluid 4 days post-operatively. Ears start to leak once again after they have stopped or the colour of the drainage changes to green pus.